Maui and Hector’s dolphins, found only here in New Zealand, have the dubious status of being among the world’s rarest. They’re the symbol of all the bad we’re doing to the oceans. But worst of all known threats to these tiny dolphins are fishing related impacts, when they get caught and drown. The Department of Conservation has a long list of incidents with Maui and Hector’s dolphins killed in nets, right up to the present day. Historically both recreational and commercial nets did the damage, but these days it’s mostly trawling that’s killing the dolphins. Probably only a few of the actual dead dolphins are reported, but some have washed up, eviscerated, partially weighted, in failed illicit disposal attempts. Others would never be found. Research from the University of Auckland Business School shows that at least 2.7 times more fish was caught in the New Zealand fishery from 1950-2010, than reported. News last week focussed on penguin populations off Southland being destroyed by trawling. New Zealand Sea Lions are hanging on for dear life because of entrapment in squid nets. Seabird by-catch is untold. Under pressure from these sorts of facts the government has planned to implement electronic video monitoring systems on the NZ fishing fleet. The National Government also promised an increase in fisheries observer coverage up to 100% in ‘core’ Maui dolphin habitat by 2017. So far, to protect these critically endangered dolphins, observer coverage is at about 18%, at the cost of reduced observer coverage elsewhere. Electronic monitoring has been supported to achieve ‘’100%” observer coverage. This has been defended by even National Party Ministers and MPs, who have seen it would ‘rebuild trust and confidence’ in the fishing industry, and have a deterrent effect on illegal practices. On the other hand, Glen Simmons from the University of Auckland said that if the true cost of overfishing and by-catch was considered, many in the fishing fleet would be out of business, so widespread are transgressions. The fishing industry itself hasn’t been so keen on full transparency, with fishing interests calling for a ‘pause’ on the camera implementation. In the absence of a comprehensive observer coverage programme; but in light of unsustainable dumping and by-catch of non-target species including endangered dolphins, sea lions, and seabirds; a culture of obfuscation in MPI; and self-regulation and capture by the fishing industry, a resolute approach from the Minister is required. In citing fishing sector privacy and cost concerns rather than addressing the issues that would make the video monitoring more robust, Minister Nash appears to have been quickly won over by vested interests in the fishing industry. His decision to ‘pause’ the programme, echoing the words of fishing representatives, puts the industry, the enforcement regime, the dolphins, and the Government’s reputation, at risk. I had hoped that the November decision was just a pause for the Minister to catch his breath and then proceed with a scheme which is that conservative even National agreed to it. But there are worries that Nash is wanting to finish the scheme. As reported by Idiot Savant Nash is considering canning the roll out of cameras, not just delaying it. Fisheries Minister Stuart Nash said many in the fishing industry were unhappy with the camera proposal and all options were on the table – including dumping it entirely. One of Mr Nash’s first moves when he became the Fisheries Minister was to put the brakes on the rollout of electronic monitoring of the commercial fishing fleet. “There are certainly concerns in the industry that there hasn’t been a proper process followed and a complete and utter lack of consultation. “That does seem to be the prevailing attitude but we haven’t made any final decision on that,” he said. Mr Nash said ditching the programme entirely was one of the options being considered. There are rational voices who are worried about how well the new system would work. But the problem is there are probably less than 55 Mauis dolphins left. And if nothing else the deterrence effect that cameras offer will hopefully delay further deaths. Doing nothing should not be an option. And the status quo will mean a gradual slide to extinction. The electronic monitoring isn’t perfect. It can be turned off, obstructed or obscured. The recorded information is to be analysed by a consortium of fishing interests. There are fears that video evidence might not always be admissible in court. Refinements are needed to improve reliability, security and transparency. But it’s better than the alternative, mostly nothing. Either way, more observer coverage is essential for sustainability of fish stocks and associated ecosystems, not less. The strange system where a Fishing Industry controlled organisation monitors the cameras needs to be reviewed. The head company includes amongst its shareholders one of the Tally brothers, well known for his largesse to various political campaigns. Allowing an industry to monitor itself is bound to fail. So I think it important that the camera installation continues. No doubt there will be problems but it will at least deter fishing boats from engaging in illegal practices. And if this is insufficient then gill nets should be banned. 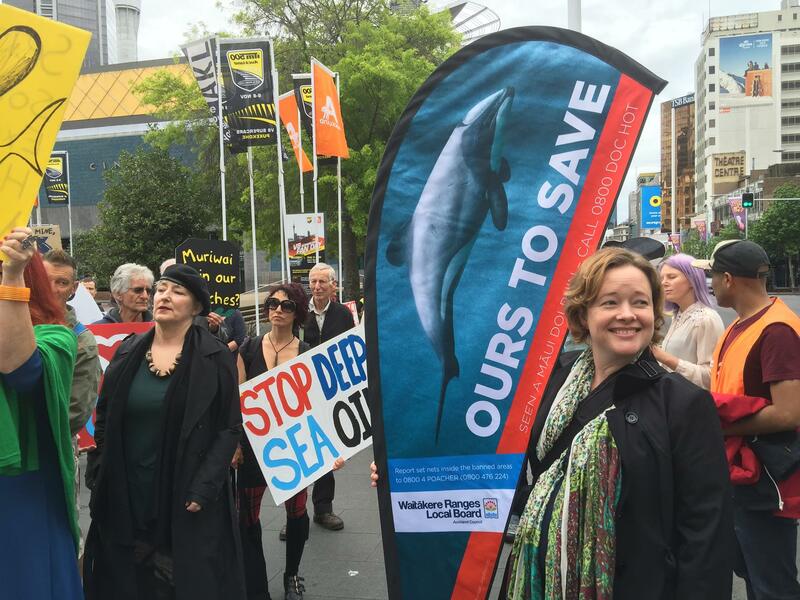 Maui’s dolphins are facing extinction and we need to do whatever we can to ensure their survival.